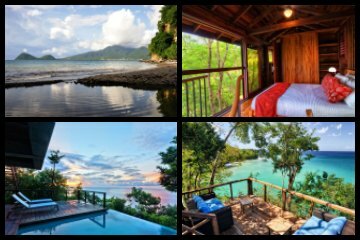 Here are the best Dominica resorts and hotels - top places to stay for your vacation: reviews of Fort Young Hotel, Secret Bay, Pagua Bay House Oceanfront Cabanas, Beau Rive, Calibishie Lodges, The Champs Hotel, Restaurant & Bar, Rosalie Bay Resort, Calibishie Cove, Castle Comfort Dive Lodge. Secret Bay is the perfect luxury eco-property for couples who seek seclusion and access to two beautiful beaches. Located on a clifftop overlooking the Caribbean Sea, this beautiful and romantic Dominica resort is just south of Portsmouth on the northwestern coastline of the island. Secret Bay has a wonderful architecture that fits well into the natural surroundings of the Caribbean Sea and the tropical landscape. Accommodations at this resort have a heavy wood interior with simple color. The smallest as well as newest additions are the two one-bedroom Ylang Ylang villas. These villas have over 1,500 square feet with great views of the tropical landscape and a private plunge pool. The three one-bedroom Zabuco and the two-bedroom Zing-Zing villas have over 2,700 square feet with more living space, a private plunge pool and gorgeous views of the Caribbean Sea. The most unique units are the Mapou and Ti-fey bungalows which are housed in a two-story treehouse-style structure with plenty of living space and incredible views of the surrounding tropical forest. All of the accommodations at Secret Bay are furnished with a full kitchen for easy in-home cooking. You have access to two different private beaches at Secret Bay which include Tibay Beach which is somewhat rocky and the white sand Secret Beach which also has a natural rock as well as a hidden sea-cave. Both beaches are good for swimming, snorkeling and you have access to complimentary standup paddleboards as well as kayaks. The property has numerous decks for meditation, yoga and just plain relaxing while overlooking the Caribbean Sea. Dining at Secret Bay Dominica resort revolves around private chefs preparing a variety of meals in your kitchen or on one of the many decks. You can choose two meals a day to have prepared for you or you can have your kitchen stocked before your arrival for ease of cooking. Other dining options exist off-site in Portsmouth where sisters Beach Bar and Restaurant serves of British pub-style dishes and the Irie Lagoon Café serves up fine French cuisine. Nightlife is quiet at this romantic resort. The Secret Bay Resort only allows children who are 12 years of age or older and babysitting services can be arranged for an additional fee. This Dominica resort does not have a fitness center or a full service spa. 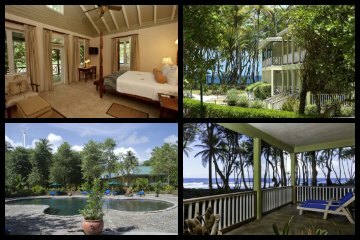 Fort Young Hotel is an ideal mid-range luxury Dominica resort which caters to couples, families and even business travelers. Located on the west-central coastline in the heart of the capital city of Roseau, the Fort Young Hotel has been a mainstay on the island since 1699. This property has a British-Colonial architecture that has a modern interior décor. There are 73 rooms and suites that feature a private balcony and incredible views of the Caribbean Sea. The smallest units are the Fort rooms which are housed in a portion of the original fort. Oceanfront rooms are ideal families because several can be adjoined for larger groups. Deluxe Oceanfront rooms have additional living space and an open floorplan. The Oceanfront suites are the largest and have room for entertaining as well as two bathrooms. Although the Fort Young Hotel is on the coastline, the beach area is rocky not usable. You can travel to several white sand beaches which are nearby like the Botanical, Champagne and Woodbridge Bay Beaches. You may also decide to walk through the historical city of Roseau which is filled with Victoria-style homes or visit the neighboring Botanical Gardens and the Dominica Museum. Numerous land and water activities can be arranged by the onsite dive shop. Fort Young Dominica resort is a nice freshwater swimming pool with waterfalls and the rooftop Jacuzzis are perfect at night. There are several dining options at Fort Young Hotel which include the fabulous Palisades Restaurant which serves eclectic international cuisine and Bala’s Bar features light fare throughout the day. Other excellent dining options are available in Roseau like the Old Stone Grill and Bar which serves great Caribbean inspired dishes as well as the Cocorico Café for French cuisine. There is plenty of nightlife within walking distance within Roseau such as Krazy Kokonuts Nightclub and Club Magic which features live DJ’s as well as plenty of space to dance. The Cannonball Kids Club is available for children from 3 to 12 years of age and features numerous organized activities. This Dominica resort contains a dive shop, fitness center, rooftop Jacuzzis and full service Zemi Spa. The Pagua Bay House Oceanfront Cabanas are the perfect choice for couples who want an eco-friendly boutique resort that has easy access to the surrounding jungle landscape and the beautiful Atlantic Ocean. Located on the peaceful Pagua Bay, this Dominica resort is situated on the northeastern shoreline of the island at the mouth of Pagua River. The Pagua Bay House Oceanfront Cabanas is relatively new having being constructed in 2010 and features unique architecture in the form of cabanas that are fashioned after an old banana plantation shed. The cabanas are quite modern on the inside with a delightful island décor. Cabanas are spacious and feature a private verandah with views of the tropical landscape and Atlantic Ocean. There are also two larger suites that have more living area space and the Garden suite features a private freshwater Infinity swimming pool for you enjoyment. The beach area at Pagua Bay is spectacular, although swimming can be challenging due to the rough currents. Better swimming opportunities exist at Pagua River where there are several waterfalls and calm pools to enjoy in a vibrant tropical landscape. The resort offers complimentary non-motorized watersport equipment which can be used on the Pagua River or the ocean. Land activities include fabulous hiking in the nearby North and Central Forest Reserves. Pagua Bay House Oceanfront Cabanas Dominica Resort has one freshwater Infinity swimming pool that overlooks the ocean and has poolside service for libations during the day. You might want to add the breakfast plan when booking your stay and dining at Pagua Bay Restaurant and Bar where excellent Caribbean infused cuisine is served. Other dining options off-site include Waitukubuli’s Authentic Kitchen and the Bluebay Restaurant for exciting seafood dishes. Children are welcomed at this property but there is not a formalized kids club with organized activities. This Dominica resort does not offer a fitness center but full service spa treatments can be arranged onsite. 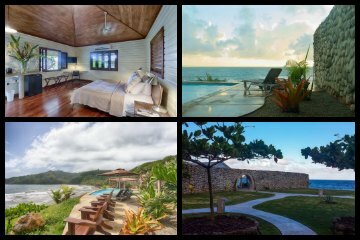 The Calibishie Lodges are a perfect choice for you when you are seeking a mid-range Dominica resort. Located on a small hilltop overlooking the town of Calibishie, the Calibishie Lodges are situated on the gorgeous northeast coastline of the island. This low-rise resort has a guest house architectural-style with a modern décor. There are six one-bedroom suites which are furnished with an open living room, a kitchenette and a private balcony with views of the Atlantic Ocean, Calibishie and the surrounding tropical landscape. You may also choose one of the five one and two-bedroom apartment-style suites at Sea View Apartments. These units are operated by the same owner as the Calibishie Lodges. Sea View Apartments have a full kitchen, living room and two balconies with views of the surrounding are as well as the Atlantic Ocean. You can visit the beautiful beach areas of Calibishie with a short 300 foot walk from your lodging and you can find numerous watersport activities from local vendor or you can have them arranged before your stay. You can also arrange for a personal driver and tour guide who will drive you to many of the islands treasured locations like Cabrits National Park or a more secluded beach area like Number One Beach. The Calibishie Lodges Dominica Resort has a nice freshwater swimming pool that has a nice deck which is surrounded by a lush tropical landscape. The Bamboo Restaurant serves an eclectic ala carte menu of international cuisine for breakfast, lunch and dinner. You can also choose to dine off-site at nearby POZ Restaurant and Bar at Calibishie Gardens which serves delightful Cajun dishes as well as Rainbow Beach Bar and Restaurant where you will find French and seafood cuisine. Children are welcomed at this Dominica resort and babysitting services can be arranged for an additional charge. This resort does not offer a dive shop, fitness center or full service spa onsite. 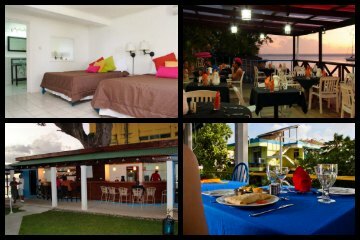 The Champs, Hotel, Restaurant and Bar is a great mid-range choice for singles, couples and families wanting to explore the island of Dominica. Located on a hilltop overlooking the Prince Rupert Bay and Cabrits National Park, the Champs Hotel is situated near the towns of Picard and Portsmouth. This Dominica resort has a limited amount of units which are furnished with a contemporary décor. Garden rooms are spacious with a private balcony which overlooks Prince Rupert Bay and Cabrits National Park. Superior rooms are located on the second floor with an added view of Portsmouth from your private balcony. You have an easy walk to the beach where you can swim, lounge or rent a variety of watersport equipment. The staff can also arrange numerous land activities for you to enjoy. You will receive a complimentary breakfast daily and you can also buy food vouchers when you are making reservations or within the first 24-hours of your stay. The restaurant and bar at The Champs Hotel has a varied menu from gourmet fine-dining on the weekends to a more casual atmosphere during the weekday nights which features seafood to tex-mex to pizza. Saturday and Sunday brunch is fabulous with live jazz. You can also dine off-site in Portsmouth at the Tomato Café and Deli as well as Sisters Beach Bar and Restaurant which has a pub atmosphere with international dishes. Nightlife can be found around Portsmouth which includes karaoke at Iguana Café or live music at Irie Lagoon Café. Children are welcomed at this resort and you can arrange babysitting services for an additional fee. There is not a freshwater swimming pool, fitness center or full service spa onsite. The Rosalie Bay Resort is a great boutique resort which specializes in health wellness for a perfect sanctuary of pleasure. Located at the base of the Morne Trios Pitons, the Rosalie Bay Resort is situated on 22-acres of pristine tropical landscape on the southeastern shoreline of the island. 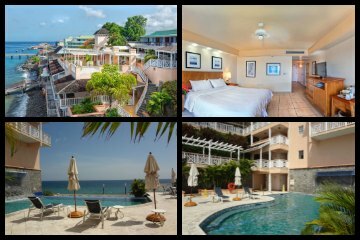 Constructed in 2011, this Dominica resort has 28 rooms and suites which are contained in low-rise buildings which offer views of the Atlantic Ocean, lush tropical landscape or the Rosalie River. There are five different categories of rooms and suites. Garden View Superior rooms are large at almost 380 square feet with a front porch sitting area. Junior suites are large at 646 square feet with a sitting area as well as a private verandah that overlooks the gardens and ocean. Oceanfront and Premier Oceanfront suites range from 750 to 800 square feet with a private sitting area and gorgeous views of the ocean from your private verandah. The Riverside suites are the largest and feature a separate living room, a porch swing and big views of the Rosalie River as well as the pool. You will be amazed at the private black sand beach but swimming is discouraged because of the strong under currents. The resort offers complimentary snorkeling equipment and kayaks which you can use to explore the Rosalie River. The Rosalie Bay Dominica Resort offers several guided hiking tours on the resorts nature trails. These trails also have specific places for yoga and meditation. There is a saltwater swimming pool which has an onyx lining and a superb river rock sun deck with Oscar’s Poolside Bar serving libations as well as a light lunch menu. Dining is superb at Zamaan Restaurant where you will find award winning Caribbean fusion cuisine served ala carte for breakfast, lunch and dinner. You may also take a short taxi ride to Riverside Café which features French and Cajun cuisine as well as the Magic Table for great vegetarian dishes. Nightlife is quiet at the Rosalie Bay Resort which adds to the appeal for when you are seeking solitude and relaxation. Children are welcomed at this resort but there is not a kids club and babysitting services can be arranged for an additional fee. The Rosalie Bay has a dive shop, fitness center and the full service Glo Spa. 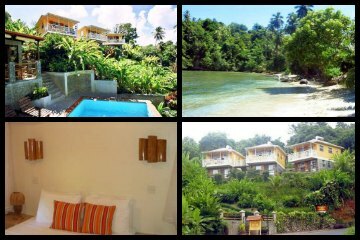 Calibishie Cove is the perfect choice for you when you are looking for an Eco-friendly boutique Dominica resort. Located on Pointe Dubique and overlooking Hodges Bay Beach, the Calibishie Cove is situated on the northeastern coastline of the island near the town of Calibishie. This resort has a nice Caribbean guest house atmosphere with only four units which feature a décor of hardwood and bright colors. You can rent the entire resort when you need to house and entertain a large group. The Garden Sea and Sea view rooms are spacious in size and offer spectacular views of the Caribbean Sea as well as the tropical landscape. The Rainforest suite is 1,000 square feet of luxurious living areas, a kitchenette and numerous balconies. Views include the tropical landscape as well as the ocean. The Paradise Penthouse suite is 1,500 square feet with an open floor plan, a full kitchen and a private plunge pool. There are also two large outdoor balconies and one on the rooftop. You will enjoy the white soft sand of Hodges Bay Beach with plenty of space to lounge, swim and you have access to complimentary snorkeling equipment. You can also arrange a variety of watersport and land activities at the Calibishie Cove Dominica Resort. Your nightly rate includes a daily breakfast served on your own private balcony and you can arrange for private dinner service from an eclectic menu that changes frequently. Other dining options are a short drive away where you will find French and fresh seafood dishes at Rainbow Beach Bar Restaurant and the Coral Reef Restaurant serves Caribbean cuisine. Nightlife is quiet on this side of Dominica and not much happens after sunset. This boutique Dominica resort does not offer a freshwater swimming pool, fitness center or spa. If you are traveling with children, you can arrange for babysitting services for an additional fee. 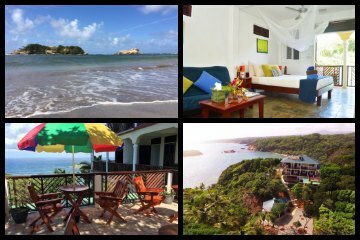 Castle Comfort Dive Lodge is an ideal choice for singles and couples who plan on spending time exploring the Caribbean Sea as well as the numerous land activities on the island of Dominica. 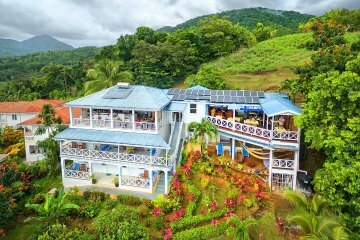 Situated along the southwestern coastline of the island, this intimate low-rise Dominica resort is located just a south of Roseau. The Castle Comfort Dive Lodge is fashioned after an original Caribbean guest house and has only 12 rooms. There are two styles of rooms that include the standard lodge and ocean view. The rooms are similar in size with a simple décor and bright colors. The ocean view rooms have a slightly larger balcony and nice vistas of the Caribbean Sea. The beach area at Castle Comfort Dive Lodge is small and rocky. To accommodate you, the resort has constructed a nice sundeck which you can enjoy the spectacular colors of the Caribbean Sea. Swimming is nice and you can rent a variety of watersport equipment as well as adventures from the onsite dive shop. If, you are a scuba diver you will enjoy easy access to daily scuba dives which can be include in several packages which are offered by this resort. There is a small freshwater plunge pool which overlooks the ocean and a poolside bar for cold libations. The Restaurant and Bar at Castle Comfort Dive Lodge serves a delightful seaside breakfast, lunch and dinner which features Creole inspired cuisine. You are also within one-mile from the capital city of Roseau where you will find such restaurants like Old Stone Grill and Bar for Caribbean dishes and Cocorico Café serves up nice French cuisine. Nightlife can also be found nearby at Ruins Rock Café. Castle Comfort Dive Lodge Dominica Resort does not offer a fitness center or spa and there are no organized activities for children. 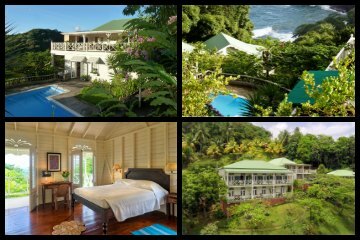 The Beau Rive is an elegant Dominica resort which is perfect for couples who are looking for luxury and a great location on the island. Located on the east-central coastline of the island, the Beau Rive is situated just north of Castle Bruce and Roseau. Fashioned after a Caribbean guest house, the resort only has eight rooms and two stand-alone cottages. Rooms in the main house are spacious and offer lots of wood and a fresh interior. You will have spectacular views of the surrounding tropical landscape and the Atlantic Ocean from a large private balcony. The cottages have an open floor plan with more living space and views of the gardens as well as the ocean. Beau Rive Dominica Resort is not a beach resort and you will need to travel one and one-half miles to the picturesque black sand beach located at Castle Bruce. You can arrange all of your activities at Beau Rive including watersports and land excursions. The resort also has many fascinating hiking trails right at your front door which will take you to Richmond River and other tropical locations nearby. There is a freshwater swimming pool which overlooks the Atlantic Ocean with a superb sundeck area enclosed by a tropical garden. You receive a complimentary continental breakfast daily with your room rate and light lunches are served during the day. Dinner is a three-course price-fix menu of delightful international cuisine atop a roof terrace with great vistas of the ocean and tropical landscape. There are no restaurants operating in Castle Bruce and you will need to take a taxi or drive for additional dining options like Pagua Bay Bar and Grill in Marigot or the Riverside Café in La Plaine. Nightlife is concentrated at the onsite bar where libations can be had all-night. The Beau Rive does not accept children under the age of 16 years old and mainly caters to couples. Beau Rive has a library but does not offer a fitness center or full service spa.